This editorial statement appears in the January-February issue of AGAINST THE CURRENT. It went to press before the full horror of the fire and heat crisis in Australia – with recorded temperatures of up to 129 degrees Fahrenheit! – had unfolded. We hope very soon to have reports on the Australian situation. 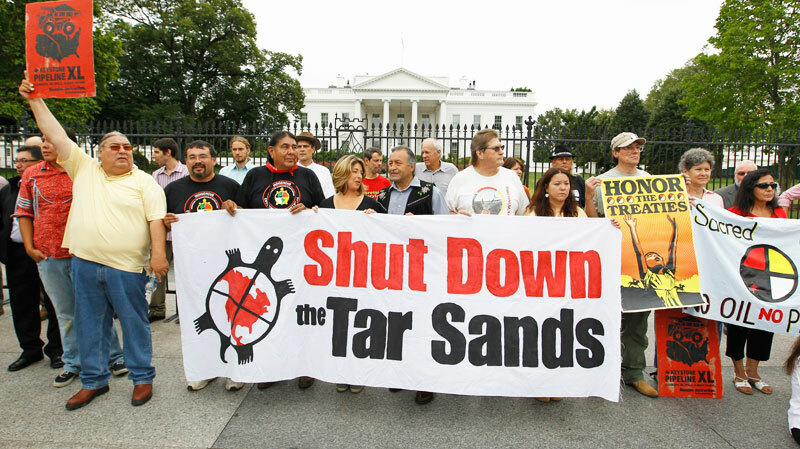 We also draw readers’ attention to the Webzine report on the Idle No More mobilizations in the Canadian state, which includes a critically important focus on environmental degradation as well as other fundamental issues. We won’t review here the scary statistics on the Arctic and Greenland icesheet shrinkage, loss of glaciers critical to agriculture in South America and Asia, melting of permafrost with its dramatic contribution to rising carbon emissions, collapse of coral reefs, and other well-documented symptoms of a hotter and less hospitable global climate — all with a temperature increase so far of only about 0.8 degrees Celsius. These have been fully explored in many hundreds of popular as well as scientific articles, books and documentaries. Depending on what actions are (or aren’t) taken now, that two-degree threshold may be reached within only a few decades — with further catastrophic acceleration to follow — or more gradually toward the end of the century with additional warming held in check by radically transforming our present fossil-fuel-dependent economy. That may be the defining choice for human society for hundreds of years to come. As author and activist Bill McKibben (founder of the network 350.org) has memorably put it, the laws of physics and chemistry — unlike politicians — do not negotiate. The interaction of these laws in a dynamic and changing system is so fiendishly complex that we don’t know what results they’ll give us, or exactly how quickly. But it’s entirely clear both from theory and observation that the consequences of the present level of fossil fuel consumption, to say nothing of the annual exponential increase, are somewhere between catastrophic and apocalyptic. Other elements of capital take a more sober view reflecting a combination of self-interest and rational thought. Well before Superstorm Sandy, the insurance industry for example has been conscious of the costs arising from sea level rise and storm surges in coastal regions, as well as crop failures and various economic disruptions. The Pentagon’s astute planners have identified the environmental crisis as a leading causal factor in 21st century warfare (while not accounting for their own considerable contribution to the catastrophe, of course). New York mayor Michael Bloomberg even repudiated Mitt Romney for his association with climate change denial. The fashionable trend called “Green Capitalism” is based around making profits from solar and wind energy, organic grocery choices, reusable shopping bags, electric hybrid vehicles and the like, all on the premise as described by author Heather Rogers, “that global warming can be stopped by swapping out dirty products for green ones, with little disruption to daily life…Eating organic breakfast cereal no longer feels unfamiliar because it’s coated with sugar and comes in cartoon-covered boxes.” (Green Gone Wrong, 5-6) Much of this amounts to greenwashing the same dirty stuff that ordinary capitalism promotes — not finding a solution at all, but providing a pretense so that capitalist life as usual can simply continue. Amidst the swirl of proposed fixes to the looming disaster, it’s possible that some of these technical innovations along with sustainable and local production, reforestation on a large scale and other schemes might actually help. Some others, notably fracking and converting food production to biofuels, unquestionably do way more harm than good and must be stopped immediately. But the larger point is that real solutions can only be found in a transformed social and political — and international — framework. Capitalist technological innovation has certainly trans­formed political economy several times over. It has done so, however, by generally increasing the use of energy to replace (i.e. enormously expand the productivity) of human labor, with the need for profit driving the whole process. That is most definitely not what the environmental crisis of our age requires. Consider a few of the immediate as well as longer-term problems that must be addressed — just within the U.S. context, to say nothing of the global one. Should coastal zones devastated by Sandy or threatened by other storms be rebuilt as they were, reconstructed with protection by seawalls and dunes, or not rebuilt for housing but redesigned as public parkland? Should large areas of the U.S. Southwest where water is disappearing be “saved” for agribusiness by massive engineering projects, or set aside for (perhaps) wind farming? Can the automobile be made environmentally sustainable, or does that industry need to be scrapped and replaced entirely? Globally the questions are even more profound. What do rich countries, whose economic growth produced the carbon-emissions crisis, owe to the rest of the world that’s being devastated by it — and what form would those reparations take? What is the future of countries like Venezuela that depend on oil exports — or of China, if its energy needs aren’t to be met by climate-destroying coal? And perhaps the ultimate question: Under the most favorable and optimistic assumptions, how quickly could the world dramatically reduce the consumption of fossil fuels and greenhouse gas emissions? There are a few essential points to be stressed for the emerging politics of “ecosocialism.” The first of these is that the environmental crisis is absolutely real, and threatens the survival of civilization and tens of thousands of species who might be driven to extinction along with ourselves. That’s the “eco” in ecosocialism. The second critical point is that human action can avert the worst consequences of climate change and environmental degradation, but this depends both on immediate action and on a profound transformation of consciousness about the crisis. Indeed, amidst all the devastating news about the annual exponential increase in greenhouse gas emissions, the proliferation of superstorms and acceleration of polar ice melt, the hopeful signs point to a growth in popular understanding about the reality of our condition. A movement inspired by Bill McKibben’s organization 350.org has sprung up on campuses, demanding divestment by university endowments from the fossil fuel industry (see http://www.nytimes.com/2012/12/05/business/energy-environment/to-fight-climate-change-college-students-take-aim-at-the-endowment-portfolio.html?pagewanted=1&_r=2&hpw&pagewanted=all&), just as the tobacco industry and South African apartheid were targeted in the past (and increasingly, the Israeli occupation today). Third and most important, the grounds on which crucial decisions are based can no longer be the demands of capital and profit. That means, of course, that the political rule of capital must be abolished so that human needs can be met, and decisions are taken through democratic institutions controlled by the masses of people whose lives and futures are at stake. This, in short, is the “socialism” in ecosocialism. In historical perspective, we can say that the unresolved question of the 20th century was the socialist revolution. Capitalism had already prepared “the development of the productive forces” and become a profoundly destructive system — as two world wars, a global depression and multiple genocides should have been sufficient to demonstrate. Let’s assume realistically that a 20th century transition to socialism, by itself, would not have prevented the onset of climate change, the magnitude of which as a product of coal and oil-powered industrial development was certainly not well understood. It’s unmistakably clear now that the global problem of the 21st century is the sustainable survival of civilization, so that the unfulfilled socialist revolution and the “sustainability” revolution have become inseparably combined. All this poses profound issues for how society can be reorganized from the local to the national and global levels; how standards of living can be sustained or raised without committing ecological suicide, and what is meant or measured by “standards of living” to begin with; what kinds of consumption may need to be restricted or relinquished; and how health, welfare, working conditions, and the enjoyment of leisure and culture can be expanded when we are freed from the demands of unending capital accumulation. The plain political fact is that climate change (along with poverty, racism, inequality and other critical issues) were never addressed by either Barack Obama or Mitt Romney in the presidential election, nor did any of the dummy “debate moderators” think to ask. That doesn’t mean the crisis is going away — it’s simply a reflection of the reality that capitalism cannot begin to solve the problem, even if and when it bothers to acknowledge it. 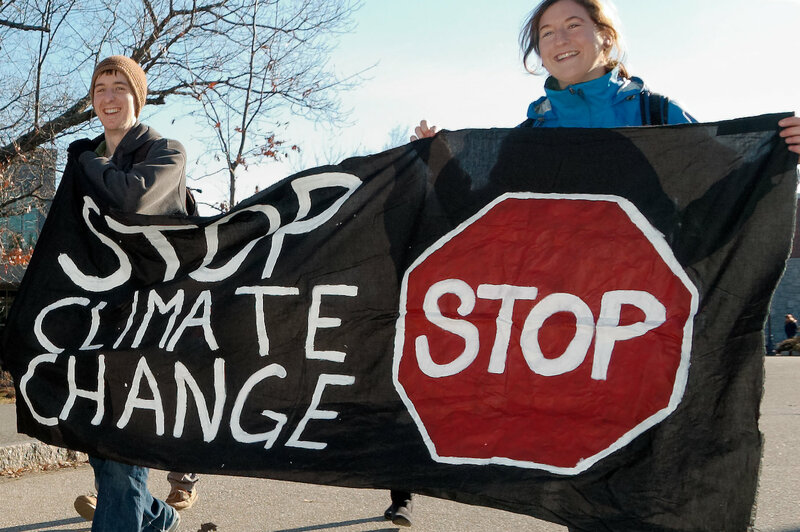 Only action at the global grassroots can begin to save the only planet we’ve got.